Human-animal relations; animal welfare; livestock agriculture; farming cultures and practices; multispecies design; design ethnography; science, technology and society. Anne is interested in supervising object, image and narrative-based research projects that challenge contemporary design practice by re-imagining our relations with nonhuman animals, plants, materials, elements, and forces of the Earth. Dr Anne Galloway joined Victoria University in late 2009, bringing her background in cultural studies and science, technology and society studies, to the study of design and the practice of design research. Anne teaches undergraduate courses in Design Ethnography and Speculative Design, and leads the More-Than-Human Lab. She encourages prospective PhD students to get in touch about opportunities in the research areas listed above. 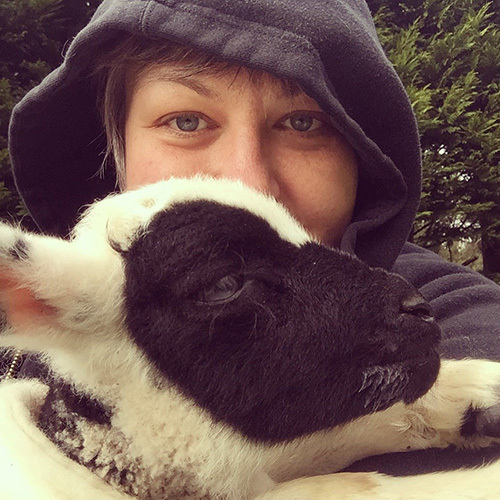 When not at work, Anne is shepherd to small flocks of Arapawa sheep and rare-breed ducks, which inspire her research into farm animal welfare and public controversies. Galloway, A., 2019, “Flock,” in Anthropocene Unseen: A Lexicon, C. Howe & N. Pandian (eds), Brooklyn: Punctum Books. Galloway, A. & C. Caudwell, 2018, “Speculative Design as Research Method: From Answers to Questions and ‘Staying with the Trouble’,” in Undesign: Critical Practice at the Intersection of Art and Design, G. Coombs, A. McNamara & G. Sade (eds), New York: Routledge. Hjorth, L., H. Horst, A. Galloway & G. Bell (eds. ), 2016, The Routledge Companion to Digital Ethnography, New York: Routledge. Burgess, J., A. Galloway & T. Sauter, 2015, “Hashtag as Hybrid Forum: The Case of #Agchatoz” in Hashtag Publics: The Power and Politics of Discursive Networks, pp. 61-76, N. Rambukkana (ed), New York: Peter Lang. Galloway, A., 2015, “Belonging in Rural New Zealand.” Royal Geographical Society (RGS/IGB) Annual International Conference, 1-4 September, 2015, Exeter, UK. Galloway, A., 2015, “On Interventionist Speculation,” Design Anthropological Futures Conference, 12-14 August, 2015, The Royal Danish Academy of Fine Arts, Copenhagen, DK. Galloway, A., 2015, “Speculative Design and Ethnographic Mobilities.” Mobile Intersections Workshop, 6-7 July, 2015, Lancaster University, Centre for Mobilities Research, Lancaster, UK. Galloway, A., 2014, “Three Uncertain Thoughts, Or, Everything I Know I Learned from Ursula Le Guin,” Design + Ethnography + Futures I: Uncertainty Symposium, 10-11 December, 2014, RMIT University, Melbourne, AU. Galloway, A., 2014, “Anthropology + Design,” Savage Minds [website]. Adapted from BoneKnitter (part of Counting Sheep), this object- and photography-based project was invited to the 2017 Vienna Biennale and will be on exhibition at MAK Vienna: Austrian Museum of Applied Arts until 2022. This online exhibition consisted of four object, image, and text-based speculative designs: BoneKnitter, Grow Your Own Sheep, Kotahitanga Farm & PermaLamb. The project was awarded Editor’s Choice in the 2013/2014 Postscapes Internet of Things Awards, and was featured in Blueprint and Modern Farmer magazines, as well as technology website Gizmodo.